One of the enormous pleasures of visiting the Victoria & Albert Museum in South Kensington is that the design museum, even with its amazing historic collections, continues also to focus on the contemporary, so one gets to see the very best of new art and design as well as the ‘classics’. 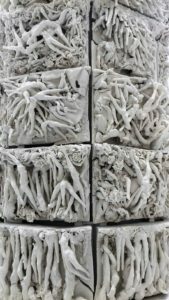 I have already written about the Jameel Prize and Frida Kalho exhibitions this year, but one other interesting and arresting contemporary piece which I saw on my most recent visit (some while ago now) was Rachel Kneebone’s 399 Days. 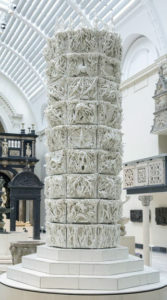 This takes the form of a monumental column, made of porcelain, though its form references the marble columns of antiquity, like Trajan’s ( a copy of which can be found in the Cast Courts of the same museum, see The Real Thing ). It is placed within the museum’s Medieval and Renaissance Collection, in the large hall (Room 50a) on the right of the entrance hall from the Cromwell Road, and looks completely at home there amid the intricately carved stone and wood altarpieces and retalbos. Like all Kneebone’s sculptures it includes minute figures, hundreds of them, flailing and entwined limbs among trailing vines and other organic forms, which make up a series of tiles around a central core which stands some five metres high. The tiles invite close scrutiny and the detail, up close, is startling. Yet decay is also part of Kneebone’s vision and the porcelain is, in places, already cracked. There are quite wide gaps between the individual tiles which allow the viewer to see the hollowness at the centre of the column, something very different from the solidity of the monuments which stand around it. In contrast this column is fragile and ephemeral. 399 Days is the largest sculpture Kneebone has ever produced. Previously she has been known for relatively small, complex, figurative pieces (and the V & A exhibited some of these last year). I could not see a narrative in the tiles, though some are referential – to Da Vinci’s Vitrubian Man, for example. The overall impression is one of movement and fluidity, not fixed and permanent-seeming like the other objects in the collection which stands around it. The placing of the this sculpture makes one look at the other pieces anew, appreciating their apparent permanence and elaborate but formal patterns. The juxtaposition raises all sorts of questions in my mind about the nature of memorial and monument in public art. The surrounding pieces/sculptures are mainly from the 16th century, though some are slightly later. I hadn’t looked at them so closely for many years, as I did when I went to see the new column. It is perfectly placed to have an impact, which radiates through the hall. The V & A is FREE to enter and the Kneebone sculpture will be on display until mid-January 2021, so plenty of time to go and see it, perhaps when you go to see another exhibition or just to browse. This entry was posted in Art, Culture Vulture, London and tagged Art, London by juliej. Bookmark the permalink.